This Walker Turner Woodworking Tools section features many of the woodworking tools sold by the Walker Turner Power Tool Company of Plainfield, New Jersey. 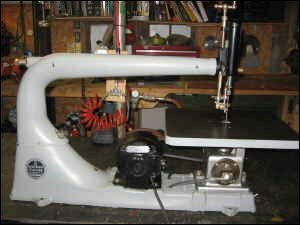 This Walker Turner Woodworking Tools section features many of the woodworking tools sold by the Walker Turner Power Tool Company of Plainfield, New Jersey. Their 1938 catalog identifies them as having all the resources of a modern plant containing over 150,000 sq. ft. of floor space devoted exclusively to the manufacture of Walker-Turner tools. do you have in your shop? Early 1940's catalogs as in the Walker-Turner Light-Heavyweight Machine Tools catalog indicate that the company was purchased by and made into the Walker-Turner Division of the Kearney and Trecker Corporation. A Background of Experience into the developing and building of Walker-Turner Power Tools goes the vast experience gained in manufacturing and selling close to half a million modern and efficient light machines. These machines... in every quarter of the globe... in every size of plant... are giving their owners economical, dependable service. Thousands have expressed their unqualified approval of Walker Turner advanced design, precision manufacture and genuine, all-around value. Behind Walker-Turner Tools is an efficient organization of trained specialists... men who know their jobs and like their work... whose sole aim is to develop the finest machines possible and to produce them in quantity at reasonable prices. These days of irregular production programs, short working hours, and keen competition call for low-cost modern power tool equipment. Walker-Turner Equipment... because Walker-Turner Power Tools have demonstrated in thousands of shops that they have wider application, cost less to buy and less to operate. They fill today's exacting requirements better than many tools selling at considerably higher prices. There are savings in store for you-- with Walker-Turner machines.